As spring is now here it’s that time again for another Las Chicas Presents screening. 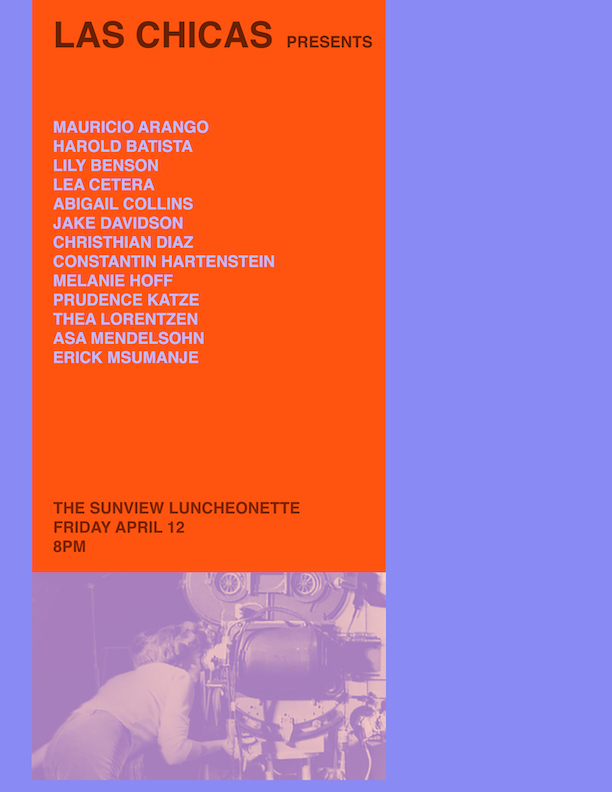 Come with your favorite beverage and sit back to enjoy some new films, videos, and performances by Mauricio Arango, Harold Batista, Lily Benson, Lea Cetera, Abigail Collins, Jake Davidson, Christhian Diaz, Constantin Hartenstein, Melanie Hoff, Thea Lorentzen, Asa Mendelsohn, and Erick Msumanje. The screening will take place Friday April 12 from 8-10pm at The Sunview Luncheonette.